Davidoff Cool Water Sea Rose Coral Reef is a feminine floral fragrance. 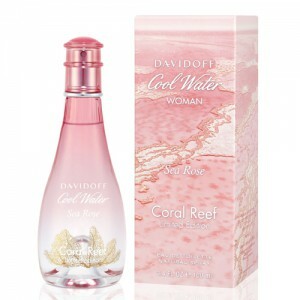 Davidoff Cool Water Sea Rose Coral Reef 100ml. Eau De Toilette - The new flavor of the popular line of Cool Water, Davidoff, a noble mission - the salvation of the world's oceans in a joint program with the National Geographic Society. Collection this year is devoted to the Pacific coral reef. Its beauty and fragility symbolize sophisticated mix of pear and peony. In March 2014 Davidoff launches a new subcollection Cool Water Coral Reef, consisting of three fragrances inspired by the beautiful coral reefs. The debut of the popular fragrance collection Davidoff Cool Water was published in 1988. Since then, the brand Davidoff every year pleases his fans with new limited edition original male and female aquatic compositions. Since 2012 the house Davidoff cooperates with the National Geographic Society, the project for the protection of the oceans, the program "Pristine Seas". New perfume trio Davidoff Cool Water Coral Reef Conservation devoted Indo-Pacific coral reef, which is often called "rain reef sea." Collection Davidoff Cool Water Coral Reef includes three limited editions: Davidoff Cool Water Man Coral Reef Edition, Davidoff Cool Water Woman Coral Reef Edition and Davidoff Cool Water Sea Rose Coral Reef Edition. Davidoff Cool Water Sea Rose Coral Reef Edition : limited edition of 2014; 100 ml, Eau de Toilette. Limited edition for women Sea Rose Coral Reef Edition has been conceived as a precious stone, resting on the bottom of the sea. Top notes are presented sparkling mandarin, replaced by a cold seductive heart of roses. The base includes a sensual and charming chord. Vials new editions have the same form as that of their predecessors in the collection, and are decorated with images of coral. Bottle color - blue, blue and pink - are also attached to the sea and coral. Outer carton publications decorated overlooking the coral reef from the air. All fragrances collection Davidoff Cool Water Coral Reef will be available from March 2014.